Shelby and Juan made their way from Los Angeles to Memphis, TN gathering loved ones from all over and uniting them in this city to celebrate their union and marriage. They exchanged vows at St. Anne Catholic Church on Highland St, and returned to the beautiful Atrium at Overton Square, a classy wedding venue full of pearl-white walls and industrial arches right in the heart of Midtown. They ended the night with a bang- La Hora Loca! Easily making this one of the most memorable, fun weddings I've ever gotten to be a part of. Juan and Shelby were overwhelmed with joy from being surrounded by all of their loved ones, but they also cherished being able to find a few quiet moments within their wedding day to be alone together and step away from the hustle and bustle to just be together. Thank you for choosing me to document this perfect day of yours and capture your big moments, your little moments, and all the in between. "My maid of honor's mom made my veil, so it was very special. I wanted something really simple and light. She sewed a pearl from her own wedding dress into the bottom corner so I would have something to fidget with if I got nervous." "We loved seeing all our friends and family in one place. But having so many people around can also be overwhelming. We had a quite ride from our ceremony to our reception, and then we even had 15 minutes to eat our dinner privately together and just take a deep breathe after all the running around from the day. It helped all the stress melt away from the day." "We loved the overall feel of the place, and the Art Deco windows of the Atrium. Also the fact that it was located on Overton Square so that we would have plenty of choices for the after party, all within walking distance from our wedding venue! The party carried on at Local until 4:30am." La Hora Loca,' meaning 'the crazy hour,' is a Venezuelan wedding tradition. Just as the party seems like it's dying, the dance floor is starting to clear out and everything is winding down.... La Hora Loca strikes! The lights dim, the music amps up, party favors seem to fall from the sky- hats, whistles, beads, and noisemakers-you name it. And just like that, without a word of warning or a gesture to head to the dance floor, everyone is already there, going, you guessed it, CRAZY! 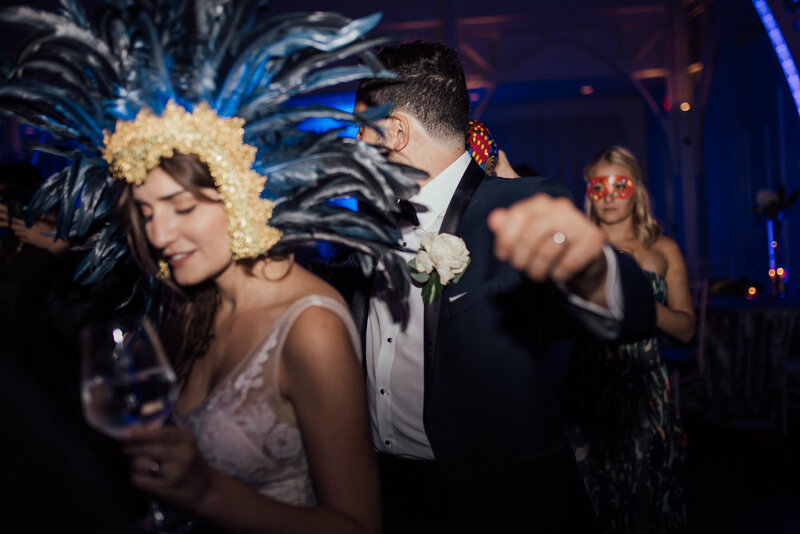 All of the energy of the room concentrates onto the dance floor, celebrating the bride and groom and for one hour it is nonstop wild dance moves and insane amounts of fun. This was without a doubt my FAVORITE part of Juan and Shelby's wedding, and I believe it was everyone else's favorite too. Everyone loosened their ties and let loose and just had a BLAST. The bride and groom said they didn't expect Shelby's family to out-dance the Venezuelans, but I think it's safe to say that everyone partied hard and danced their hearts out!